I would recommend wearing any of these sneakers with white, or a solid one-tone outfit to add a touch of color. Ideal for those moments with friends at a lounge, these sneakers will certainly get the attention of many and express your sense of style. It has been said by many, that the first thing they notice when meeting with someone is not their shirt, jacket, sunglasses, cufflinks, trousers, jeans, or watch, it's their shoes. To some shoes are a minor outfit complimment, to others a collectors item, while others consider them as something that adds a final touch to their ensemble. I could go on and on regarding the shoes every stylish gentlemen must have in his wardrobe, which are appropiate for certain ocassions and seasons, the variety of colors and materials. But this time I would like to display on two original pairs of canvas sneakers. The first one, a pair of Tommy Hilfiger Peace Symbol print sneakers in red, navy blue, and white. The Peace Symbol is one of those iconic symbols from the 60s. Besides this pair, one can find a black and orange pair and other accessories all from Tommy Hilfiger. 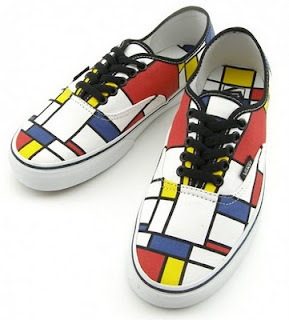 The second sneaker pair is from Vans and it has all over them the iconic Piet Mondrian painting which was made popular in 1965 by Yves Saint Laurent with his Mondrian dress collection. These sneakers are literally a piece of art.